All those movie and TV buffs out there had better make sure you are free this weekend. In case you missed it, Adelaide now has its own film and screen centre which is the also the home of the South Australian Film Commission. 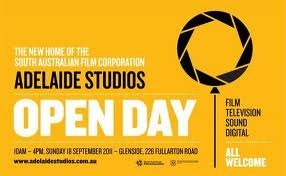 We are all able to take a sneak peek inside with its open day this coming Sunday. Adelaide Studios is made up of sound stages, screening rooms, editing suites and a 96 seat screening theatre, all just on the outskirts of the the CBD at the Glenside campus. Current projects include post-production on the movie 'The King is Dead' produced by Rolf de Heer and Nils Erik Nielsen, shooting of the TV series 'Resistance' for the ABC and coming soon will be the follow-on to Wolf Creek which will start filming in 2012. On Sunday lots of different events will be happening in and around the studios. You will be able to take a self-guided tour around the site or join in one of the guided tours running hourly from 11am to 3pm. If you are also interested in the historical aspects of this area then The Glenside Hospital HIstorical Society will also be running tours of the state heritage listed clock-tower building. These tours will run half-hourly from 10.30 to 12.30pm and 1.30 to 3pm. Back on the film side of things there will also be a free screening programme where you will be able to see some of the classics such as Storm Boy (1976) which is showing at 11am and Napoleon (1995) which you can see at 1pm. Other entertainment includes a couple of sets by the music collective Bach to Blues who will be performing in the courtyard. Luckily for lunch the Burger Theory boys will be around so you can try out some of their delicious fare. This really is a great chance to take a look around one of the newest and exciting projects that has come to Adelaide.